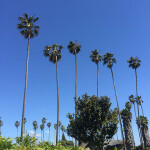 I get contacted by a lot of companies to review products on the blog and I do my best to filter them to keep things interesting and relevant to what we do here at TIB. 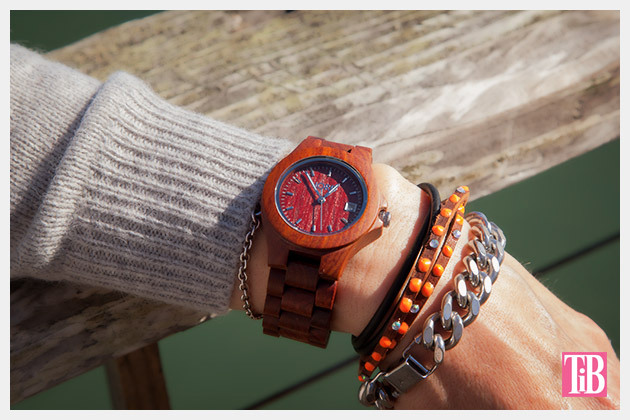 I have to admit I fell in love with this wooden watch from Jord Watches, it’s truly unique and perfect for fall. I chose the Ely in cherry and I love it! 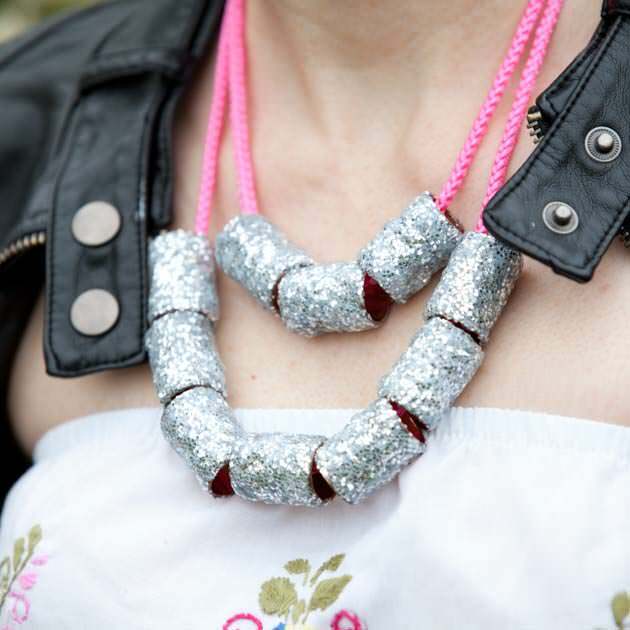 It’s so beautiful and mixes up so well with all those DIY bracelets we’ve been making. The wood is so unexpected and these watches are sure to get attention. Surprisingly lightweight it’s perfect for fall! 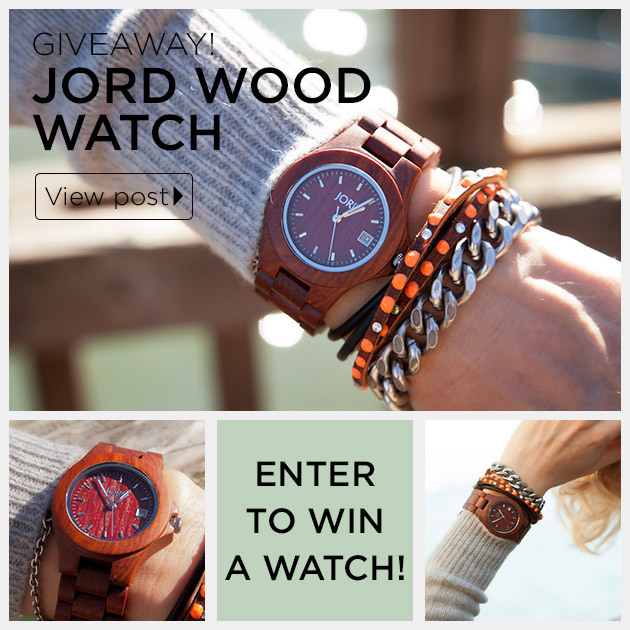 The wonderful people at Jord Wood Watches are generously giving away a gift card for $129 plus shipping so you can choose the watch you want. They have both men’s and women’s watches so it would make the perfect gift for someone on your list or keep it for yourself! Leave a comment below and tell me which watch is your favorite and be sure to enter for your chance to win! The contest runs through November 25th! This is a sponsored post. I have received product for this post, however all opinions and concepts are my own. I’m not sure which is my favorite, but since I’d definitely use this to get my BF (a lifelong carpenter) a new watch I know he’d love! CORA SERIES Zebrawood & Turquoise – layered with lots of bracelets! 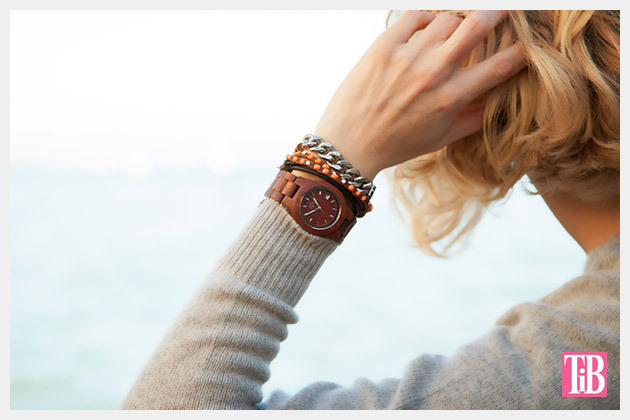 I absolutely love the Cora wood watch. The combination of rich wood color with the very on-trend rose gold face is stunning. The wood alone makes it such a statement piece. I HAVE to have it. I love, love, love these watches and have for quite some time. I just never pulled the trigger on buying one for whatever reason. 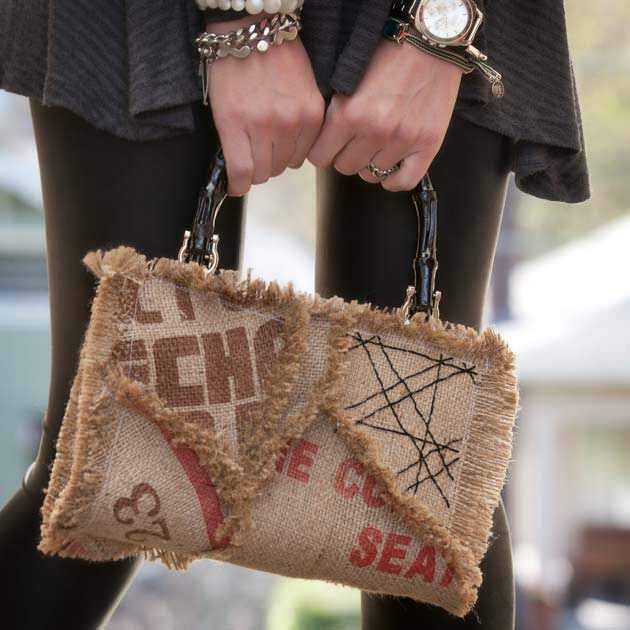 My favorite is the Cora in Zebrawood and Turquoise and I would style it with a great boho look. I like SULLY SERIES Black & Maple and would style it with a nice jean jacket. 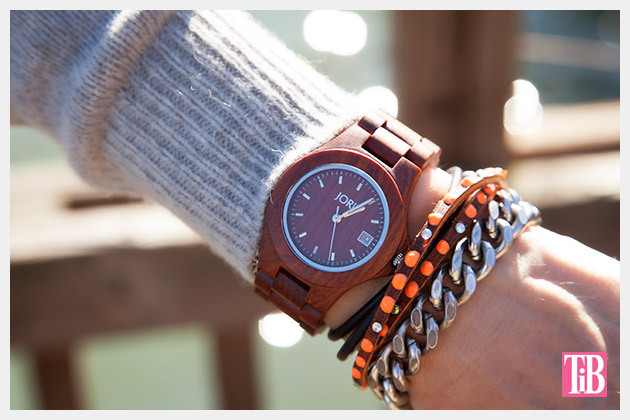 Love these wooden watches. My husband makes wooden bowls as a hobby and I think he would love one of these. I just love the warm tones of the darker woods and they are so unique. 746 cccheryy and black. Looks like a piece of artistry. I absolutely love the Cora Series Zebra Wood and Turquoise ladies watch. I am part Native American and wear Turquoise jewelry all the time. This watch would be such a complimentary piece to wear. These watches are SO beautiful- I’d wear it alone or stacked with bracelets. Ely Maple – love the blond look. I love the Fieldcrest Black! I would wear it with no bracelets! Ely natural. Is so beautiful…! I cannot decide. I love all of them!!! I like Sully in Cherry & Maple. I would wear it with jeans and a tee. Ely Cherry, i would style it with fall colors ! I love these watches! So unique! I love the Sidney watch in cherry & mother Pearl!!! This one goes best with my pearl bracelet and some metal bracelets as well! I have no idea how, but it took me ONLY 15 min to decide which one is my favorite – CORA SERIES Koa & Rose Gold! I love pastel colors and this watch is great example of my taste. 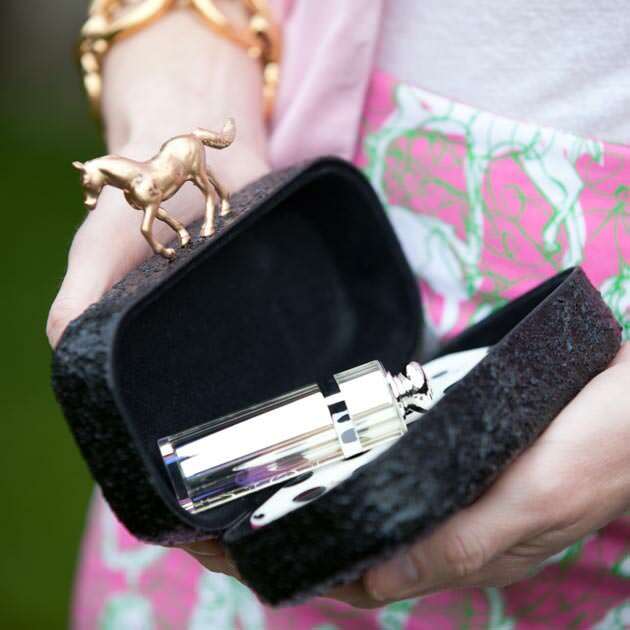 It can be combined so easily, whether you want to look elegant, or perhaps casual. The important thing is to wear what makes you feel good in your own skin, and everyone around you will pick up on your positive energy. Love them all, but I’ll pick Fieldcrest in zebra wood and maple. My boyfriend makes amazing wooden spoons, so I love the wood. i LOVE LOVE LOVE the cora in turquoise & zebra wood!!! i’d wear it every day with everything!! I picked the Cora series Zebrawood & Turquoise. I love the pop of color. I think this would look great with a casual jeans and a T outfit, and then you see this classy and colorful watch that is kind of a surprise. I absolutely love the Cora series Koa and Rose Gold – I can see many stacking possibilities with this. It is beautiful! Second in line is the Ely series in Natural or Maple. JORD is a beautiful and unique line. Love the Ely in zebrawood! I like the Fieldcrest Black the best and I would give it to my husband for Christmas. I love the Dover series. No particular styling for me. I like the 94a in chocolate. 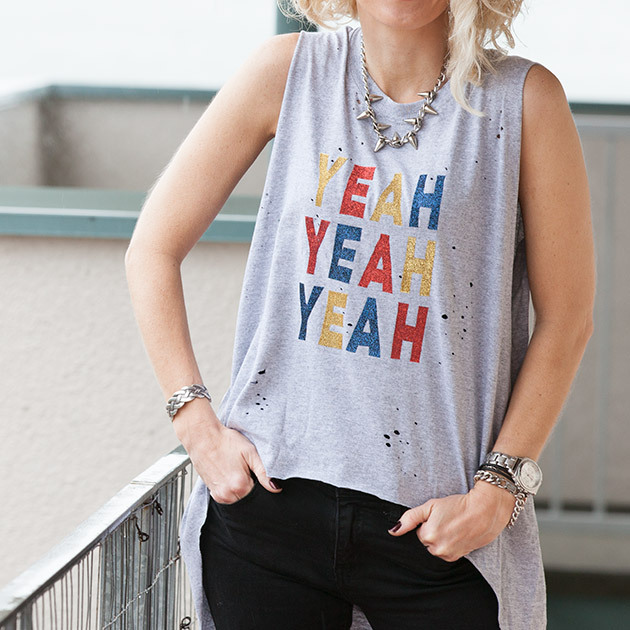 I would give it to my boyfriend…he’s the fashion expert and knows how to style it. I need a new watch! I love the fieldcrest in natural green. Can i have an extra entry for being family?? i love the ely in zebrawood and i would wear it out to dinner!! love the ely in red. Definitely like the ELY Natural Green & Maple…..unique and classy! Would compliment it with a simple, natural pearl bracelet. I love most the Delmar model: its rectangular face combined with the georgous wood bracelet makes it both modern and timeless. All and all, Jord watches examplify what is superior craftmanship. Oh! and, while I usually mingle many bracelets on each arm, I would wear my Jord watch ALONE, as the queen of watch AND wrist ornement she is. My favourite is the Cora in Koo and Rose gold. I would pair it with some jeans, black boots, and a nice sweater. Wooden watch will be the new experience in India.. i was not aware about this type of watches.. great to see them..and now its giveaway.. These are beautiful! My favorite is a toss up between the Fieldcrest and the Fly in that dark brown. They would look great with all my silver bracelets and my leather cuff in dark brown! The CORA with turquoise face. 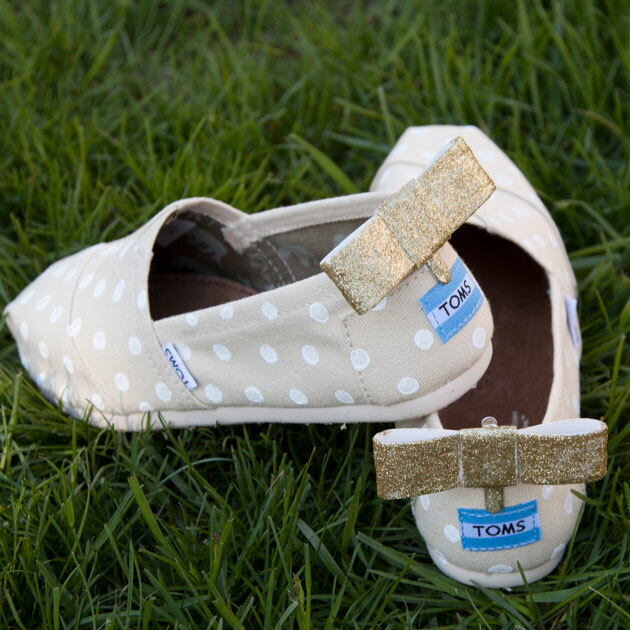 The Ely is sweet in any color as well! That is the most elegant watch I have seen. Fieldcrest Dark Sandalwood! I’m in love!!! and hope I win! These are the most beautiful watches I’ve ever seen… It’s very hard to choose my favorite one. I ABSOLUTELY LOVE the ELY RED SANDALWOOD, very close next to that is the CORA series with ZEBRAWOOD and turquoise, followed by the KOA and ROSE GOLD.